Health insurers in Obamacare’s exchange plans have perverse incentives to attract healthy patients and deter sick ones from enrolling. This is because the law forbids insurers from charging premiums that reflect applicants’ likelihood of incurring high medical costs. Although there are risk-mitigation mechanisms to overcome this, they appear to be inadequate. If this photo does not tell us that insurers want healthy people to apply, I don’t know what will. A little context: I took this photo in a train on the Metro in Washington, DC, just a few days ago. CareFirst, which holds the Blue Cross Blue Shield license in Maryland, is the dominant insurer in the metropolitan area. It has major market share in the Federal Employees Health Benefit Plan (FEHBP). Open enrollment for the FEHBP ran from November 10 through December 8. 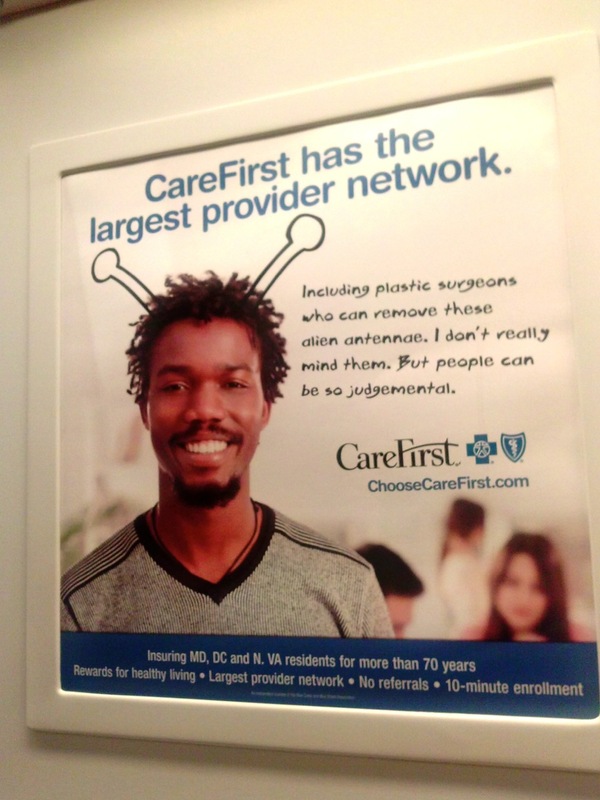 The Metro is the perfect place to attract public servants’ attention, so CareFirst buys lots of advertising space during FEHBP open enrollment. Those ads usually feature middle-aged actors, who project a staid bureaucratic image as they peruse their choices for the upcoming year. FEHBP open enrollment is closed, but Obamacare exchange enrollment is open through February 15. So, the ads have changed. Let’s examine this fellow. Does he really care about access to high-quality care? (CareFirst’s provider network is large because of the FEHBP, whose beneficiaries do demand good access.) If he really does think that aliens have implanted antennae into his head, he needs psychiatrists, not plastic surgeons. Of course, he doesn’t think he is wearing alien antennae. He is just goofing around. If Obamacare were designed for sick people, CareFirst would feature cancer patients, not frat boys, in its ads.